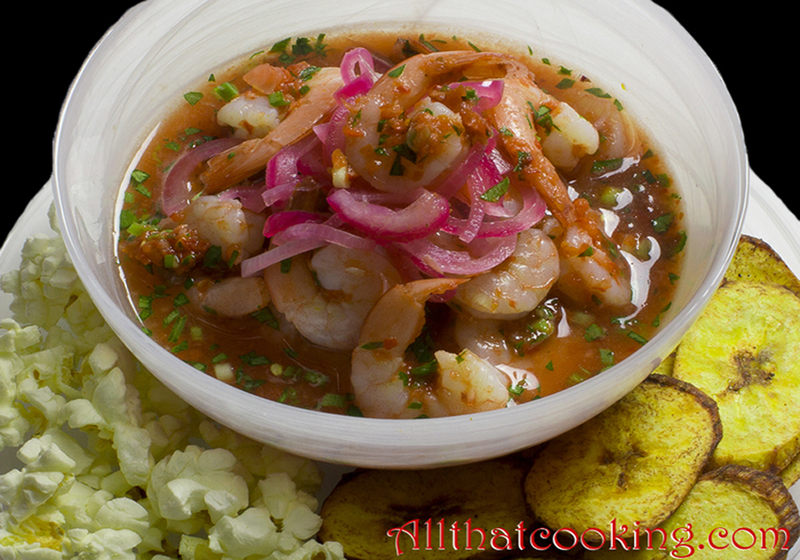 Right from the beginning I want to point out that the shrimp in this ceviche are COOKED. In Ecuador it’s policy to briefly cook any seafood for ceviche before marinating. Oli prepared this ceviche in April when the Virginia Beach weather was still chilly and damp. After just one bite, we knew this is food to serve after a long, hot day at the beach! You cannot imaging how divinely refreshing this is. The gazpacho-like marinade is lite yet zippy. Those marinated onions have an unbelievably mild, citrusy sweetness and crunch that enhances the overall freshness and summertime flavors of seafood, garden tomatoes and fresh herbs. In Ecuador, ceviche de camaron (shrimp ceviche) is served with fried plantain chips and a toasted chulpe corn snack called cancha. You can purchase chulpe corn in the Spanish food section of your grocery store or in Latin markets. It is a pointy kernel that pops when heated, but doesn’t burst and puff up like the popcorn we know. It puffs up and toasts – like corn nuts. Since Oli decided to make this dish on the spur of the moment good ole popcorn was an appropriate substitute for the cancha. In fact, popcorn as we know it is a frequent accompaniment even in Ecuador. Prepare the shrimp, pickled onions and the marinade before you head to the beach. About an hour before serving all you have to do is add the shrimp to the marinade and pop it back in the fridge to marry all of the goodness. By the way, this absolutely calls for an ice-cold cerveza or two. 1. In a large pot, over high heat, bring water, salt and limes to a boil. 2. Throw in shrimp and cook for only a minute. 3. Remove shrimp and drain. When cool, peel shrimp but leave tails on. 4. Discard water and limes. 5. Refrigerate shrimp until serving. 1. In a medium bowl combine onions and salt. Let sit for 10 minutes. 2. In the meantime, in a medium sauce pan, over high heat, bring water to a boil. Be prepared to work quickly here. You don’t want overcooked, mushy onions. So have the colander ready to go. 3. Place onions in a colander. Rinse and drain well. 4. Add onions to boiling water for only 20 seconds. Remove them to colander and drain. 5. Rinse onions with cold water and drain well. 6. In a medium glass bowl, combine onions and lime juice. 1. In the bowl of a food processor, process garlic, onion, tomatoes, bell and chili pepper until well combined. Transfer to a medium glass bowl. 2. Add scallions, cilantro, ketchup, vegetable oil, orange juice, lime juice and salt to tomato and pepper mixture. Stir to combine well. 1. Give the sauce a good stir. Salt and pepper to taste. 2. Gently mix in shrimp. 3. Refrigerate for about an hour. In the meantime, you can make the plantain chips and/or popcorn. 1. In a deep pot, heat oil to 350 F.
2. Slice plantains very thinly and toss with salt and chili powder. 3. Gently lower them into the hot oil and fry until they take on color. 1. Spoon shrimp and sauce into individual serving bowls. 2. Top with pickled onions. 3. Plantain chips and/or popcorn on the side. Gallery | This entry was posted in Appetizers, Main Dishes and tagged Ceviche de cameron, cooked chrimp ceviche, Ecuadorian shrimp ceviche, Gazpacho-like marinade, pickled onions, shrimp ceviche. Bookmark the permalink. 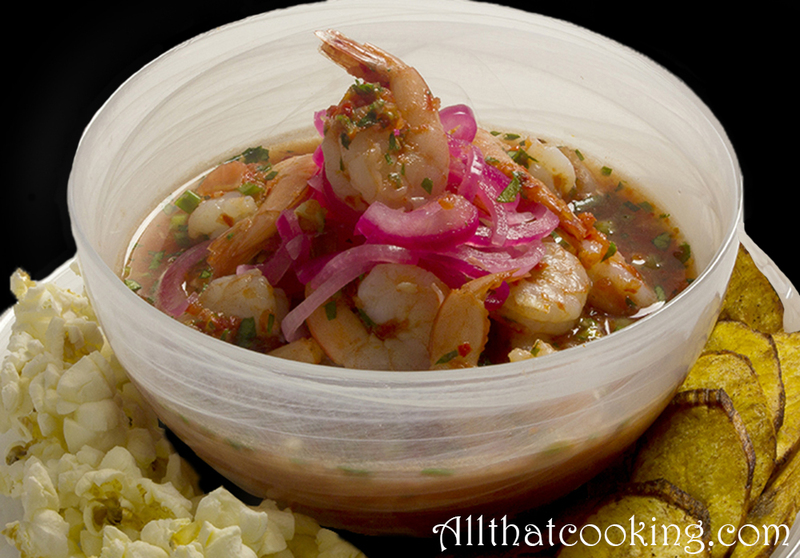 I know nothing about Ecuadorian food, but your shrimp ceviche looks ever so inviting! Plantain chips must be quite addictive. Ecuadorian style or not, the shrimps look delicious. The recipe for the Ceviche seems complicated though. Any short cuts allowed? Hmmmm short cuts – ok. . . you could purchase pre -cooked shrimp and make the sauce the night before. However, the onions need to be made the day you plan to eat the ceviche. If you prepare them too far in advance, they will be come soggy. They are delightfully crunchy and refreshing when served with the ceviche. Just be sure to marinate the shrimp about an hour before you plan to serve them. The recipe might look complicated, but there are only three steps and none of them take very long to prepare. Shrimp, sauce, onions. These steps should make it a bit faster. Omg! I had this at my friends house her grandma made it and it was amazing! I have been dreaming about it since. This recipe is amazing!! The taste was what I have been searching for!